In 2005, Doctor Who launched a tradition that would last another 12 years with “The Christmas Invasion” – a festive special that broadcast on Christmas day. But “Invasion” wasn’t actually the first Doctor Who episode to air on Christmas. The first actually took place 53 years ago. “The Feast of Steven” is a wild slice of Doctor Who history, responsible for a few infamous firsts beyond just being what is technically Doctor Who’s first Christmas special. While the classic era of Doctor Who would regularly air story arcs that had episodes running during the Christmas period, “The Feast of Steven” – the seventh episode of the 12-part epic serial “The Dalek’s Master Plan” – was the only one to actually broadcast on December 25. As such, “Feast” is an utterly bonkers-sounding story that has absolutely nothing at all to do with the Daleks and their latest plot to dominate the galaxy. 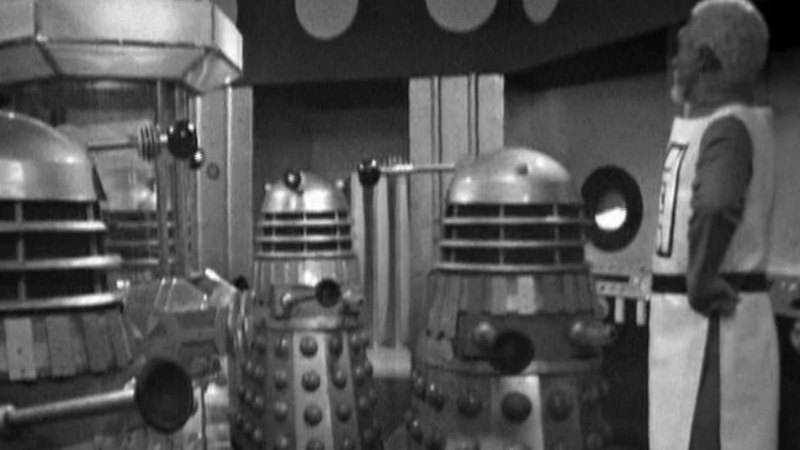 At the end of episode six, “Coronas of the Sun,” the Doctor and his companions Steven and Sara – the latter a space agent who joined the Doctor during the events of “The Dalek’s Master Plan” and then actually died at the end of the serial, beginning half a century of fandom debates about whether she counts as a companion – make a brief escape from the Daleks and the traitorous villain Mavic Chen, and find the TARDIS landing in 1960s London. After a scuffle with some local police officers – who are understandably concerned that people who look like the exact opposite of police officers are mucking about with a Police Telephone Box – that leads to Steven having to disguise himself as a special branch officer and break the Doctor out of interrogation, the trio dash back into the TARDIS and take off... to 40 years prior, on a Hollywood film set in the 1920s. The back half of the episode is almost just as absurd as the initial dilemma with the police. Steven is pressured into replacing an injured movie star and gets in a farcical chase, Sara just hangs around in empty sets, and the Doctor, mistaken for a historical adviser on an upcoming film, bumps into both Charlie Chaplain and Bing Crosby. After reuniting at the TARDIS and dashing off to get back to the actual ongoing plot of “The Dalek’s Master Plan,” the Doctor surprises Sara and Steven with a tray of drinks in the TARDIS... before explaining the date when they landed in London at the start of the episode was actually Christmas Day. As they all toast, the Doctor then makes another moment of Who history: He turns to the camera, and wishes the viewers a Merry Christmas, a rare instance of the series breaking the fourth wall. “The Feast of Steven” isn’t really a great episode beyond its historical curiosity – after all, it’s a lighthearted bit of story to act as a TV serial equivalent of an interlude. It’s only really remembered for its infamy, not just because it’s Doctor Who’s first Christmas special – something that wouldn’t happen again until “The Christmas Invasion” in 2005 – or for being the first time the show broke the fourth wall, but because it is also one of the first episodes of Doctor Who to become a victim of the BBC’s archival junking of its program backlog. The policy, intended to free up space for newer recordings to be saved, lasted through much of the ‘60s and ‘70s and led to over 100 episodes from Doctor Who’s earliest years (and many other old BBC series) being lost to time. Even today, 97 Doctor Who episodes remain lost, with “The Feast of Steven” among them – it, alongside episodes 1, 2, 4, 5, and 9 of “The Dalek’s Master Plan” are believed to be some of the first episodes of the show to be wiped. “Feast” is even more unique beyond that; because of its bizarre festive nature, the episode was never sold to international broadcasters as part of “The Dalek’s Master Plan,” making it all the less likely that it’ll ever be recovered. For now, and seemingly forever, “The Feast of Steven” only exists in a handful of pictures and as off-screen recordings of its audio track, made by fans literally putting recorders in front of their TVs as it aired. It’s the only way we actually know what happens in the episode, at this point – and can discover just what an odd piece of festive Doctor Who history it actually is.